Truly international congregation! We have Christoph Gallio (Zurich) - saxophones, Eduard Akulin (Tallinn) - trombone, Mart Soo (Tallinn) - guitar & effects, Kalle Laar (Munich) - guitar & electronics, and Takashi Kazamaki (Tokyo) - percussion. 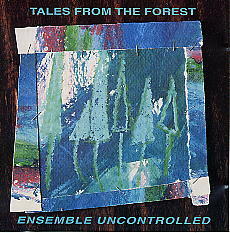 Don't be misled by the title ENSEMBLE UNCONTROLLED. These musicians play highly controlled, spontaneously structured music. Twelve pieces are performed live in different combinations of musicians and instrumentation.